Pipe Dream or Paradigm Shift? You say bubbles, he says biocompatible surfactant—let’s call the whole thing off? For 15 years Chicago biochemist Raphael Lee has worked to bring a revolutionary therapy to trauma Patients. Sometime back in 1990, Raphael Lee squinted through a microscope and watched as a slippery synthetic compound called poloxamer-188 stirred up a revolution. The ensuing odyssey would become political as well as scientific, but first there was simply an empirical discovery: a hypothesis and an experiment. In his surgery lab Lee had isolated a culture of rat muscle cells and delivered a deep, destructive electric shock. 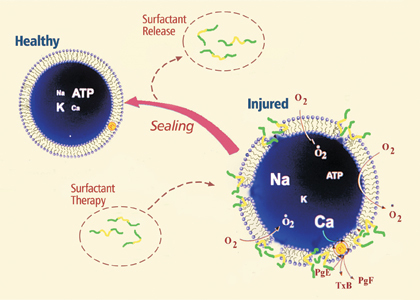 Vital intracellular material began gushing from tiny holes in the cell membranes. Then Lee doused the culture with poloxamer-188. Racing across cells ravaged by electricity, the compound sought out and mended the holes. Instead of dying, the tissue healed. Two years later Lee, a surgeon and biomedical engineer who directs the University’s Program for Research in Molecular Repair, had conducted a host of similar experiments, with equally promising results. 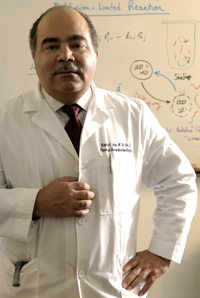 That May he published an account of his findings in Proceedings of the National Academy of Sciences, arguing that poloxamer-188 helps repair traumatized cells by resealing their perforated membranes and restoring the cells’ basic wholeness. In 1995 the Food and Drug Administration gave Lee the green light to begin testing poloxamer-188 (P188 for short) in human victims of electrical shock. Here Lee found himself in uncharted territory. No researchers had written papers on the mechanics of cell-membrane repair. Instead, he says, they’d conjured “vague ideas about things like fusing membranes together.” In 1989 Lee became a surgery professor at the University. He’d been living in Boston, splitting his time between faculty appointments at Harvard and the Massachusetts Institute of Technology (where, as a research scientist, he won a 1981 MacArthur “genius” fellowship). Sometime during the family’s move to Hyde Park, Lee’s five-year-old daughter opened up a bottle of Mr. Bubbles bubble solution. Lee’s mind flashed. Surfactants are everywhere. They constitute the active ingredients in soaps and detergents—and bubble solutions. They show up in glue, fertilizers, herbicides, laxatives, lubricants, cosmetics, ink, and paint. Possessing both a hydrophilic component, which water attracts, and a hydrophobic component, which water repels, surfactants reduce surface tension. Oil, for instance, is a surfactant. Poured into a pot of water or a pond, oil coats the water and reduces the surface tension between it and the air. Lee chose the surfactant P188 for its abundance, its nontoxicity, and its shape. A hydrophobic middle sandwiched between two hydrophilic ends, P188 mimics the composition of the cell membrane’s lipid bilayer, in which water-loving heads line the exterior and interior walls, isolating water-repellent tails at the membrane’s center. 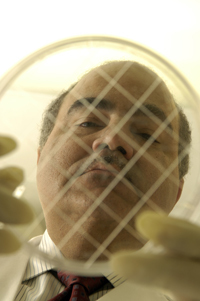 Lee (holding a petri dish) believes similar therapies can help heal myriad traumatic injuries. “The poloxamer won’t go into a normal cell,” says Chicago chemist and professor Ka Yee Lee (no relation), loading onto her laptop a colleague’s animated simulation of P188’s effect on ruptured membranes. She began collaborating with Raphael Lee in 1999, when he was recruiting chemists to help decipher the healing process. Her computer screen blinks and a full-color illustration appears, showing a lipid bilayer broken in several places. When she presses a command key, a handful of P188 molecules pop into view, veering purposefully toward gaps in the cell wall. The surfactant’s hydrophobic center buries itself in the membrane’s hydrophobic tail region, filling in the open spaces and forcing the lipids to cram closer together until the membrane becomes a solid wall, its “barrier function” restored. The surfactant “only goes into cells whose integrity is damaged,” says Ka Yee Lee, “where the lipid packing density is reduced,” meaning the lipid bilayer is perforated and more loosely formed than it should be. “That’s good; it means the polymer [P188] is selecting out the cells that need repair. ... And once it’s present, it increases the packing density immediately.” Raphael Lee’s experiments indicate that if cells are treated within six to eight hours of an injury, P188 can reverse up to 77.4 percent of shock-induced trauma. When P188 is administered before the injury—a rare circumstance in the real world—the percentage rises to 96.3. But reflexive recalcitrance wasn’t the only fuel for skepticism. In clinical trials conducted in the early 1990s by researchers independent of Lee, P188 had proved toxic to some heart-attack patients. The problem, Lee says, arose from a misunderstanding. Believing that the poloxamer operated by facilitating blood flow to damaged tissue, some researchers advised physicians to administer much higher doses than turned out to be necessary. “They were giving hundreds of times the amount of the polymer over a sustained time than we find required to seal the membrane,” Lee says. “We give a bolus”—a small intravenous dose—“and then later another bolus. But if you think the polymer is necessary to keep the artery open—that that’s how it works—then you give it for days.” Like most anything else, in very high quantities P188 can turn toxic. Money shortages also plagued Lee’s hoped-for clinical trials. The National Institutes of Health wouldn’t foot the bill because testing P188 on electric-shock patients doesn’t fall into a fundable category. And the idea of spending millions of dollars to develop a treatment for an injury that affects only 2,000 or 3,000 people every year failed to entice pharmaceutical companies. “After all, they have shareholders too,” Lee says. The Electric Power Research Institute contributed a few hundred thousand dollars, but it was not enough to cover clinical-trial costs. In 2003 a surge of excitement from scientists and pharmaceutical officials greeted the creation of Maroon Biotech Corporation, which Lee and other Chicago researchers founded to help bring P188-based therapies to market. Soon, Lee says, Maroon Biotech will ask for FDA permission to test P188 on patients who’ve suffered spinal-cord and brain injuries. Lee has kept FDA approval up to date for clinical trials involving electric shock, and Maroon Biotech plans to undertake those tests too. Company researchers currently are conducting preclinical studies, refining the P188 cocktail, a mixture of the poloxamer and other compounds aimed at heightening its efficacy. They’re also hunting for other surfactants—natural or artificial—that may work even better than P188. “The goal is to find something more effective, or to tailor a particular therapeutic product to a particular injury,” says Millicent Firestone, a chemist in Argonne National Laboratory’s materials-science division who joined Lee’s P188 research four years ago. Working with artificial lipid bilayers and manipulated versions of P188, Firestone says the poloxamer’s basic three-part shape is “optimal. It binds to the membrane, but not too tight.” She’s hoping to find other poloxamers that bind even more reliably. With that, Lee turns to his crowded bookshelf and plucks down a thin volume. “Here’s one of my most recent publications,” he announces, peeling open the cover of the fall 2004 Perspectives in Biology and Medicine. At the back of the journal, behind weighty ruminations on evidence-based medicine, gene therapy, and the Osler-Cushing Covenant, Lee reviews the latest biography of Ignaz Semmelweis, who spent the last eight years of his life trying futilely to convince Hungarian and Austrian physicians that washing their hands before walking into the delivery room would help prevent childbed fever. Semmelweis finally suffered a nervous breakdown and died in 1865, two weeks after being committed to a mental hospital. Years would pass before Joseph Lister and Louis Pasteur proved Semmelweis right.